2 What Is Victor Dog Food and How Does It Work? 3.1 Complex Minerals for Healthy sheen and Assist metabolism. 4.1 You'll know that your choice of dog food is going to offer your dog some key ingredients in their diet. Your dog isn't just a pet; they're a member of the family. And if you want to give them a diet that has a significant amount of protein, but little to no filler, read here to learn more about Victor Dog Food. Their selections of chow for canines may be the best choice for your four-legged loved one. What Is Victor Dog Food and How Does It Work? Complex Minerals for Healthy sheen and Assist metabolism. You'll know that your choice of dog food is going to offer your dog some key ingredients in their diet. This dog food is the reason my dogs are healthier. ​No more LAB Gas! A cause for celebration! I thought my dogs would devour this product but it’s been 6 hours in the bowl and they all do an occasional sniff and walk away from it. - Great taste... Not so much? Victor dog food promotes itself as a Super Premium Pet Food. Dogs have the option of dining upon grain-free recipes like Yukon River Canine with Salmon and Sweet Potato, or Lamb Meal & Brown Rice Formula. Victor food creates a wide range of dog food formulas that satisfy the requirements of all types of dogs at various stages of life. There is Victor dog food for active puppies and dogs, diets formulated for senior dog health, performance, and high energy. Victor only uses preservatives that are natural and plant-based, to optimize the absorption of free radicals, and stabilize their products against oxidation and degradation. Because of the risk of allergies in dogs, Victor dog food doesn't use any corn, soy, or wheat in their formulas. If you are interested in buying a bulk supply of Victor dog food, Chewy.com is one of the best sources online. Dog owners can also find the brand at certain pet specialty stores, hardware, and even independent feed and farm locations. The Victor brand is available in both a dry kibble form or canned and is made entirely in the United States. All of Victor dog foods have met or exceeded the nutritional level requirements as set forth by the AAFCO Dog Food Nutrient Profile. Many dog foods contain anywhere from 50% or more of carbohydrates and filler. However, Victor dog food seeks to create specialized formulas that only contain 30% of carbs. Victor looks for some of the best ingredients to give your dog a meal worth eating. Any dog who gets to chow down on a bowl of Victor dog food will benefit from specific beneficial ingredients. The ingredients chosen for Victor's premium, select and grain-free formulas are robust and offer substantial health benefits. Organic selenium yeast supports a canine's healthy metabolism, immune response, and cellular regeneration. Complex minerals are added to Victor’s dog food to give your dog's coat and skin a healthy sheen and assist metabolism. Both prebiotics and probiotics are added to the dog food to support a healthy digestive system, contribute to overall gut health, and provide additional support for the immune system. Made in Mount Pleasant, Texas, Victor dog food is a protein-lovers premium dog food. 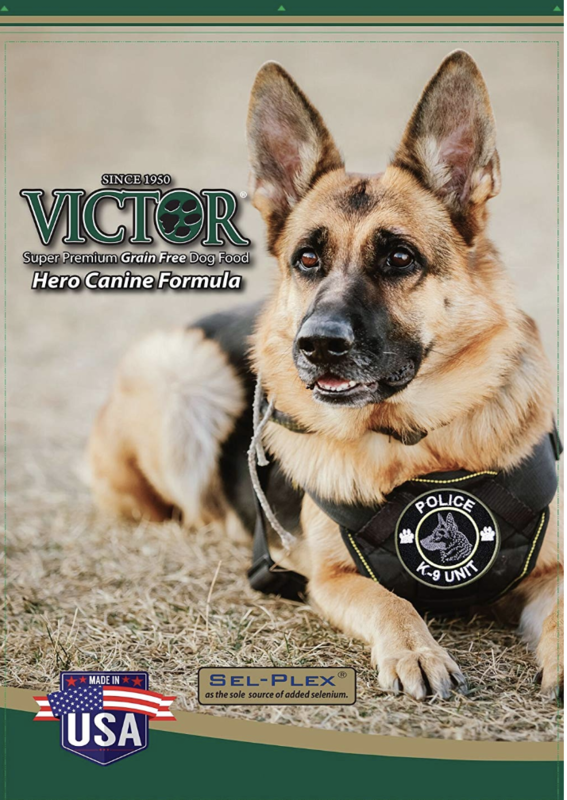 The formulas created for Victor's food utilize the most current and advanced information surrounding nutritional support and optimizing the health of dogs. Each ingredient is selected purposefully to support metabolism, digestion, and immune defense. Every formula of dog food does not contain any fillers or additives like corn, wheat, soy, or gluten. Canines who do exhibit an allergy to grains may find themselves thriving after making the switch to Victor dog food. Victor is a unique brand that stands out from the competition for its quality of ingredients used, and it is the official food of Duck Commander. Mid America Pet Food is the small company that is the heart and soul of Victor kibble. It's a group of dedicated individuals that have pride in providing active and working dogs with the necessary amount of quality protein that they need to thrive, stay healthy, and enjoy optimal performance. The Victor brand is gluten-free and doesn't use any artificial preservatives, colors, or flavors to degrade or mask their products. Dog owners who believe that dogs thrive best when on a diet that is dominated by proteins will love this brand of dog food. There is a minimal amount of vegetables in Victor’s food formulas, and there are unnecessary fillers or fruits. Beef is the primary animal protein source for most of Victor's formulas, with only one exception that is salmon-based. The meat sourced is a concentrate that boasts 300% percent more protein than a measure of fresh beef. The fats that your dog craves for a shiny and healthy coat and skin come from chicken fat, canola oil, and flaxseed included in Victor dog food formulas. Recommended formulas include the Victor Hi-Pro Plus formula provide dogs with 30% protein, 33% carbohydrates, 20% fat, and 3.8% dietary fiber. Active puppies and dogs get their protein from beef, chicken, fish, and pork meal. Dogs who are overweight, relatively sedentary, or have specific joint conditions may want to pass on this formula. The fat content has the potential to help a dog put on weight if not active. The Yukon River Canine formula has 33% protein, 35% carbohydrates, 15% fat, and 3.8% dietary fiber. This formula may be the perfect fit for dogs who have allergies to grains, beef, pork, and poultry. The Hero Canine formula is similar to the Yukon River dog food, providing canines with 33% protein, but only 34% carbohydrates, 16% fat, and 3.8% dietary fiber. This recipe is grain-free like the Yukon and has omega fatty acids to give your dog's coat a beautiful sheen. Dogs who may have joint conditions and need support may be more responsive to this formula, which contains chondroitin and glucosamine. The unique brand uses recipes that keep active dogs in mind, who are out in the field or need substantial amounts of energy derived from healthy fats and protein to keep going strong. There are not many formulas that contain ingredients that support joint health, but many recipes do include antioxidants, prebiotics, and probiotics which are helpful for digestion and the immune system. Victor brand dog food does include dehydrated alfalfa meal which has nutritious benefits for dogs, but it is often used to boost the protein in dog foods. Tomato pomace is added for the nutritional benefit and as a filler, but it may contribute to gassiness in dogs. 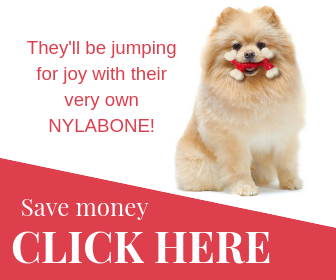 Considering Chewy and other online sites that sell Victor products offer reasonable coupons or at least offer free shipping on orders, you'll be happy investing in an ample supply of dog food from Victor. Choosing a dog food that is palatable to your furry friend, and doesn't exacerbate any digestive issues or allergies can be a challenge. Unfortunately, some ingredients used in many dog foods can contribute to flatulence, or create loose stools. Victor dog food receives high marks from the general public, despite the short amount of time that has made itself available on the market. Some customers have mostly been able to find the Victor brand at feed stores, but conveniently many online venues do sell it for broader access. 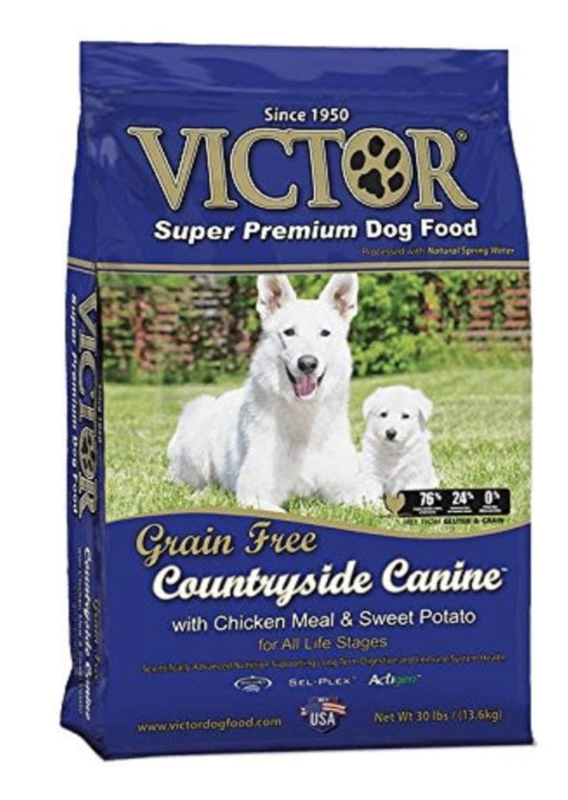 One customer on Amazon is quoted commenting about Victor food, "My dogs LOVE this food. I put it down and they gobble it up. It causes zero gas and zero loose stools." Another customer on Amazon rated the dog food with a 5-star rating, and commented, "We believe feeding a higher protein has been very beneficial to their well being." A dog owner of two German Shepherds and one French Bulldog credited the food online at Chewy.com with a 5-star rating. They commented, " This is the only food they all do well on! A bag of High Pro Plus lasts us a month..."
Overall, most customers who feed their dogs the Victor brand compliment the quality of the food, and value Victor's food formulas for dogs who have allergies, digestive problems, or need to put on weight. Victor food is on the more expensive side for pet food, but it is a worthwhile investment into caring for a dog's health and dietary needs. The results that many owners see after feeding their beloved fur babies Victor is worth the cost. We took a look at competitors like Purina One and Diamond Naturals to compare against Victor. Here are the stats that you should value before deciding on Victor. The first ingredients that you will see in any Victor brand are meat-based, which means they put a priority to give dogs sufficient sources of proteins to satisfy their hunger and nutrition. Comparing Purina One dry dog food to Victor's dry dog food, Victor scored higher percentages of protein, fat, and fiber. With wet and canned dog food, Victor contained more fat but had slightly less protein and fiber than Purina One brand dog food by less than 1%. Both Victor and Diamond Naturals have high ratings from customers who have dogs. Diamond Naturals and Victor both promote their brands of dog food as Super Premium, but it's creative liberty to market their products and create interest. Both Diamond Naturals and Victor are gluten-free, but Diamond Naturals does offer a broader range of flavor options and formulas of dog food. Both brands give dogs sufficient nutrition for daily maintenance, healthy glossy coats, and promote healthy stools. Although Victor does make an emphasis on protein and lists the first ingredients in their formulas as being derived from animal protein meal, most of the protein provided by Victor and Diamond Naturals uses more plant-protein sources rather than animal proteins. Lovers of animal proteins as a better source of nutrition for dogs might be in for a small surprise, but both Victor and Diamond Naturals use high-quality sources of plant and vegetable proteins that promote digestive health, and ready absorption of nutrients and minerals rather than say an additive like soy. The Victor brand does have a bit more fat in its products than competitors, but that is because Victor is ideal for active working dogs that need that extra boost of energy. 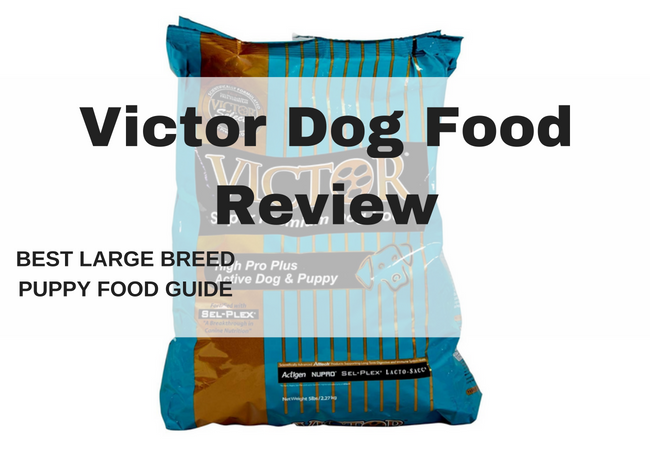 Victor has a strong presence, watertight branding, and quality products that are suitable for dogs who prefer to eat dense foods with high protein content. There have been no recalls involving any of Victor's dog food formulas, or their other products manufactured for cats, or horses. Victor has 17 varieties of dry dog food available for sale. Many of the company’s dog food formulas do not have any grains, which is excellent for dogs who have allergies. The brand is good for large breeds, active dogs that work on ranches and farms, or dogs that frequently go on hunting excursions. There is not much included in Victor food regarding joint health for dogs, but the attention to immune system support and digestive health, thanks to the inclusion of antioxidants, prebiotics, and probiotics is noteworthy. If you believe your dog should be eating a meal that is heavier on proteins and fats, you'll want to choose Victor over other brands. Active dogs thrive best on Victor's formulas because of the ratio of proteins, fats, and carbohydrates contained. There are many coupons and deals online for Victor food products. You can find coupons on Paw Diet for free shipping using Amazon, Jet, or Chewy for Victor pet food. Some coupons require that you spend over $$ before you can take advantage of shipping, or offer 20% savings for first-time customers setting up an auto-ship order. Featured Image: CC0 Public Domain via Amazon with text, banner, and logo added.